If you are introducing children to gardening it is often difficult to know what they can move on to after sunflowers and pumpkins. 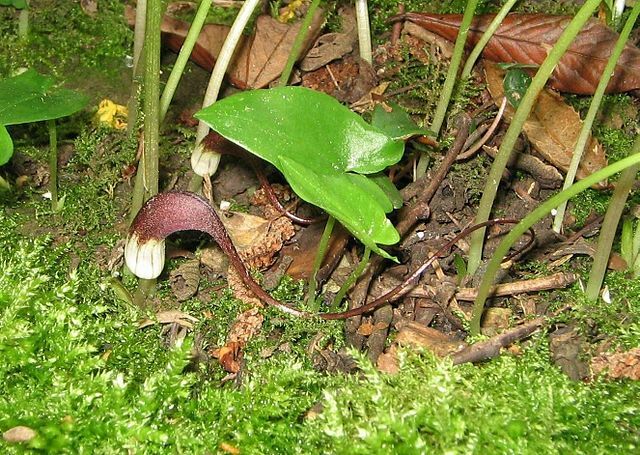 Get down on your hands and knees with them in late Spring, move apart the leaves of Arisarum proboscideum and there, nestling in the foliage, is a family of mice. It’s an amusing sight, no matter how old you are and the oddity of the plant will have them squealing with delight and eager to grow it for themselves. It is not a difficult plant to grow and will flower reliably. Children can easily divide established clumps in early summer, and have their own nest of mice the following year. The ‘mice’ are, in fact, tubular spathes that inflate over the plant’s flower for an inch or so and then thin out to a six-inch long curving tail. The chocolate brown colouring, with a white belly, completes the mimicry. A native of woodlands in Italy and Spain, Arisarum proboscideum grows from a tuber and is a relative of our native Lords and Ladies, Arum italicum, and of Jack-in-a-Pulpit, Arisaema. The glossy, arrow-shaped leaves form a carpet of fresh green just a few inches tall that would be worth growing even without its hidden treasure. While its spread is rapid, particularly in soils enriched with humus and leaf-mould, it is not invasive, and unwanted plants are easy to dig up. Being a woodlander, the plant prefers the cool days of early April and May, when its flowers are at their most abundant. As the weather heats up the foliage begins to shrivel until, by August, the whole plant has died down and become dormant until the following Spring. A. proboscideum’s mouse impersonation is not the only trick it has. Inside the spathe, part of the flower resembles a fungus and has a faint smell of mushroom. This is at a time of year when there are few real fungi around and the smell attracts fungus gnats. The insects enter the flower to lay their eggs, brushing against pollen that will pollinate the next flower the gnat visits. Unfortunately for the gnat, the plant is not a true fungus, so when their young hatch there is no food for them and they die. This gruesome characteristic led the nineteenth century Italian botanist Giovanni Arcangeli to describe it as ‘the most peculiar plant in Europe’. While Arisarum proboscideum is only found in woodlands the other member of the genus is much more widespread and adaptable. I first came across Arisarum vulgare on an early-spring cliff-top walk near the Franco-Spanish border. The hooded flowers were breaking out of rock crevices and seemed to be thriving despite the salt-spray and inhospitable conditions. Known colloquially as Friar’s Cowl the flowers resemble the head of a cobra. A few day after seeing it by the sea I came across the same species growing in woodlands in the Pyrenees. Despite this tolerance of a wide range of conditions A vulgare is rarely grown in British gardens, perhaps due to its reputation as a very toxic plant. A rich, open soil under deciduous trees and shrubs is A. proboscideum’s preferred habit but it will also grow well in dry shade. I’ve even grown it in the near-impossible conditions at the base of a conifer hedge. If you are planting it in a dry and shady place dig some compost into the planting hole and in late autumn mulch over the area in which the dormant plants are growing with leaf-mould. The drier the soil, the shorter the flowering period, so if the soil is very dry during the spring watering will prolong flowering. The tubers do not like to dry out completely so avoid buying the plant as a dried tuber. Like snowdrops, you get far better results from a growing plant.